Abuja, Nigeria. July 29th, 2014 – Latest Special Edition Security snap poll results released by NOIPolls Limited have revealed that Nigerians consider “Political interest (election issues) (26%)" and "Unemployment”(21%) as major cause of terrorism in Nigeria. These were followed by “Bad government/Leadership” (10%) and "Poverty" (8%). More findings revealed that almost all of the respondents (99%) are aware of the recent activities of terrorist groups; as well as aware of the abduction of 200 Chibok school girls in Borno State (98%). Also, 46%of the respondents are of the opinion that government and security agencies are not doing enough to rescue the abducted girls; while 54% believe they are doing enough. Furthermore, the result reveals that the 66% of the respondents believe that the abduction of the girls can potentially hinder girl-child education, especially in the North-East region. 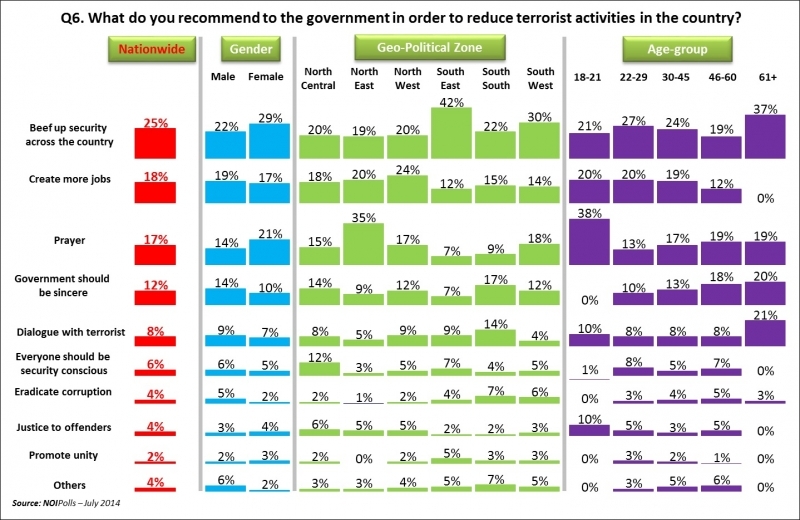 Finally, top suggestions proffered by Nigerians to tackle terrorism include: “Government should beef up security across the country” (25%); “Create more jobs” (18%); and “Prayer” (17%). These were the key findings from the Special Edition Security Snap Poll conducted in the week of July 21st 2014. Security is critical in ensuring growth and development for any nation. 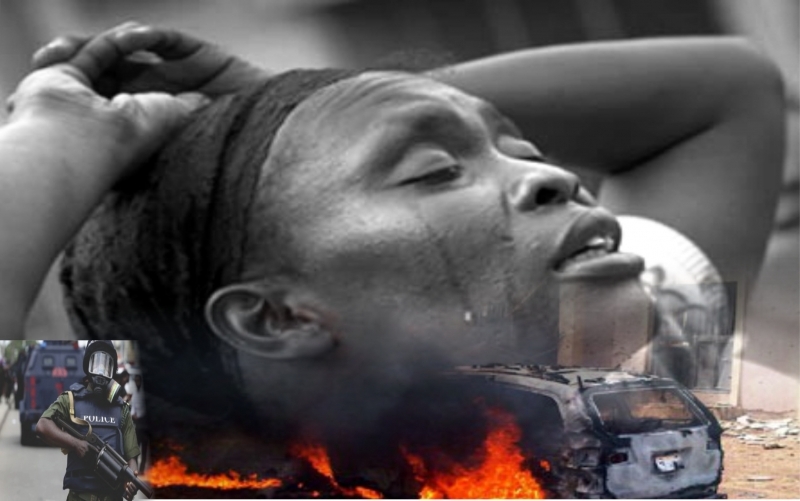 In present day Nigeria, the plight of Nigerians has been characterised by ethnic genocide, (i.e clashes with Fulani herdsman), bloodshed (i.e recent bombings) and insecurity due majorly to the activities of terrorist groups most notably “Boko Haram” which has created unrest in the country.The direct effect of these terrorists activities in Nigeria is not only limited to the loss of lives and property but also to the disruption of economic activities, thereby impeding peace, economic growth and political development. It’s effect is also seen in the distortion of socio-cultural stability as well environmental deterioration. In April 2014, the abduction of 276 school girls from the Government Secondary School in Chibok, Borno state was claimed by Boko Haram. This event generated worldwide attention with the #BringBackOurGirls hashtag trending on twitter worldwide. At present of greater concern is the fact that after over 100 days, the girls are yet to be rescued. In July 2014, Malala Yousafzai, a 17-year-old Pakistani education right activist brought her crusade for the education of the young girl-child to Nigeria. In her campaign, she declared that her wish is to see every child go to school. She also stated “I want to see my Nigerian sisters being released from their abduction and I want them to be free to go to school and continue their education,”. Still relating to the abduction of the girls, President Goodluck Jonathan on Tuesday 22nd July 2014 in Abuja reassured the Chibok community that his Administration was doing everything humanly possible to rescue the abducted girls and return them safely to their parents. Against this background, NOIPolls conducted its recent snap poll to seek the opinion of Nigerians regarding the activities of terrorist organisations and the possible root causes; as well as the abduction of school girls and its implication for girl-child education,with a view to proffering some remedies to addressing the issue of terrorism in the country. Respondents to the poll were asked six specific questions. The first question sought to gauge the awareness of the activities of terrorist groups in Nigeria, respondents were asked: Are you aware of the recent activities of terrorist groups in Nigeria? Almost all adult Nigerians (99%) surveyed confirmed they are mindful of the recent actions of the terrorist group in Nigeria; this cuts across gender, geo-political zones and age groups. Subsequently, in order to guage the perceptions of Nigerians on the causes of terrorism, respondents were asked:In your opinion, what is the major cause of terrorism in Nigeria? From the results, a slight majority (26%) perceived that “Election/political interest” is the major cause of terrorism in Nigeria, followed by 21% of the respondents who attributed the issue of terrorism to “Unemployment”, “Bad government/leadership” (10%), “High level of poverty” (8%) and “Corruption” (6%). Further analysis across geo-political zones revealed that the North-East zone had the highest proportion of respondents that stated “Election/Political Interest” and “Unemployment” with 37%and 32% respectively, while the North-West zone had the largest proportion (13%) of respondents who were of the opinion that terrorism is caused by “High level of poverty”.Respondents aged above 60 years had the highest percentage of respondent who believe terrorism is caused by “election/political interest” (43%), while the 18–21 years age-group had the highest percentage of respondents (40%) who considered “unemployment” as the major cause of terrorism in Nigeria. To ascertain the level of awareness on the abducted Chibok school girls, respondents were asked: Are you aware of the abduction of the “Chibok school girls”? The findings revealed that 98% of the respondents are aware of the abduction of the Chibok school girls in Nigeria, while 2% claim that they are not aware of the incidence. Furthermore, respondents were asked: In your opinion, do you think that the Nigerian Government / security agencies are doing enough to rescue the Chibok school girls? In answer to this question, slightly more than half of the respondents (54%) responded positively acknowledging that the Nigerian Government/Security agencies are doing enough to rescue the Chibok school girls. On the contrary, 46% of respondents were of the opinion that government/security agencies are not doing enough to rescue the Chibok school girls. From the geo-political zones perspective, the South-East zone had the highest proportions of respondents (72%)who perceived that the Government/Security Agencies are doing enough to rescue the Chibok school girls. The South-West zone had the highest number of respondents (54%) who felt the Government/Security Agencies are NOT doing enough to rescue the Chibok school girls. This was closely followed by the North-East zone and the North-West zone with 53% and 52% respectively. Respondents were also asked: To what extent do you agree or disagree that the abduction of the Chibok school girls will hinder girl child education especially in the North-East region? The results revealed that the vast majority of respondents 66% (35%+31%) agreed the abduction of the Chibok school girls can potentially hinder girl-child education in the North-East region, whereas 13% of those surveyed remained neutral. On the other hand, 21% (17%+4%) of respondents disagreed that the abduction of the Chibok school girls will hinder girl-child education in the North-East. The North-East zone had the highest proportion of respondents 82% (38%+34%) who thought that the abduction of the school girls will discourage girl-child education in the region, followed by the South-West zone with 72% (40%+32%). The South-East Zone had the largest number of respondents 30% (25%+5%) who disagreed that the abduction of the girls will hamper girl child education. Also, the age-group of 18 – 21 years had the highest proportion 82% (42%+40%) of respondents who agreed the abduction of the school girls will discourage girl child education in the region, while those aged 60 years and above have the largest ratio (28%)who disagreed. Finally, respondents were asked: What do you recommend to the government in order to reduce terrorist activities in the country? Based on the responses, 25% of Nigerians advised that the government should; “Beef up security across the country” in order to minimize terrorist activities; whereas 18% said “Creation of more jobs”. Other suggestions by Nigerians include: “Prayer” (17%); “Government should be sincere” (12%) and “Dialogue with terrorists” (8%). The South-East had the highest (42%) proportion of respondents who suggested that “Beef up security across the country” could help curb terrorist activities in Nigeria. Also, the North-West accounted for the largest ratio(24%) of Nigerians who stated that “Creating more jobs” would reduce terrorism. In addition, the North-East zone had the highest (35%) who suggested “Prayers”. Furthermore, more female (29%) than male (22%) respondents indicated the government should “Beef up security across the country”. Respondents aged between 18 – 21 years have the highest proportion (38%) who suggested “Prayers”. In conclusion, the findings of this current poll has revealed that the vast majority (99%) of Nigerians are aware of the recent activities of terrorists in Nigeria, as well as the abduction of Chibok school girls. Also, Political Interest (26%) and "Unemployment" (21%) were identified as the two major causes of terrorism in Nigeria; thereby beaming the searchlight on politicians and government policy makers. More findings revealed that 98%of the respondents are aware of the abduction of the Chibok school girls in Nigeria, while 46% believe that the government and security agencies are not doing enough to rescue the abducted Chibok school girls, Nigerians have suggested that the government should “Beef up security across the country” (25%) “Create more jobs”,(18%) and “Prayer” (17%) among other suggestions.